by Jerald Simon on April 7, 2017 in FREE Resources, Motivation in a Minute! The words I CAN and the words I CAN’T can make or break you. Both statements are true. You can and cannot do anything you tell yourself you can or cannot do. What you tell yourself repeatedly you believe. The question is do you really believe in yourself and your abilities or do you listen when others tell you what you will and will not be able to do in life. The most important voice is yours. 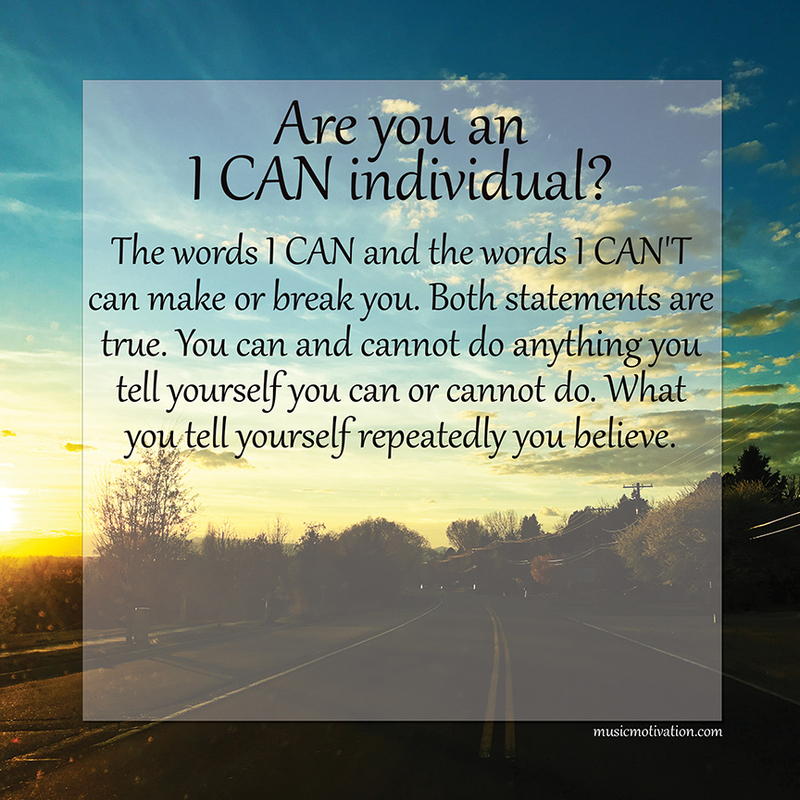 Are you an I CAN or an I CAN’T individual? We all have heard countless stories of great individuals who were told they could not do something, and yet, despite everyone telling them what they could not do, they overcame the misplaced misconceptions and beliefs others imposed upon them. They believed in themselves and their ability when no one else would. They were determined and dedicated to accomplish what they knew they could accomplish. They believed it and achieved it! This persistence enables men and women to do amazing things in their lives because they believe in themselves even, and especially, when others tell them to stop or continually remind them they are not good enough, intelligent enough, privileged enough, and on and on. The naysayers of the world continually try to cut others down while the men and women who believe in themselves and in their ability get up each time they fall. They don’t quit. They continue and improve each day. That belief is powerful beyond words. We can strengthen others with our words by telling them they are good enough, intelligent enough, and capable enough to do whatever they set their mind to do. If we think we can, we can. If we think we cannot, we won’t. This is a short story I wrote to teach the principle of thinking positively versus that of thinking negatively. In a not too distant part of the world there was a big island, and a little beyond the island was a small isle. Both lands were beautiful. Both lands were abundant with natural resources and both lands were inhabited with people. On the big island, the people were very productive and active. They never wasted their time or complained about the work they did. Everyone was very successful and accomplished so much. In addition to the great success of the people on the big island, they also had many hobbies, interests, and wonderful experiences. They lived life to its fullest. 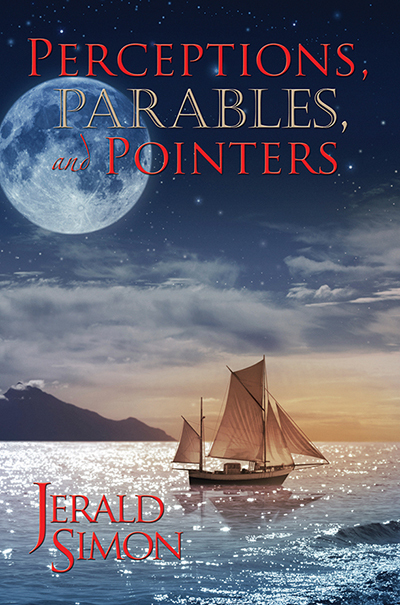 Their world was bright, beautiful, and a blessing because of their optimistic outlook on life. Everyone on the big island believed and knew they could accomplish anything they set out to accomplish and knew they could become anyone they wanted to become. They all believed in themselves. The island was known as the island of “I CAN”. The little isle beyond the island, however, became known as the isle of “I CAN’T” because of the negativity of the people who lived there. They, unfortunately, were not productive at all and thought they would fail if they attempted to do something they had never done before. As a result of this thinking, no one did anything because they would not challenge themselves and push the limits of possibility. To them, everything was impossible. It was agreed – a group of families, men, women, teens, and children from both the “I CAN” island and the isle of “I CAN’T” traded places. It was an adventure! Now there were “I Can” islanders on the isle of “I CAN’T” and there were also “I Can’t” individuals on the island of “I CAN”. Both groups decided to remain in their new area for two years and then return and see how the groups were doing. Two years later came sooner than either party had expected and so they decided to return and report of their activities. 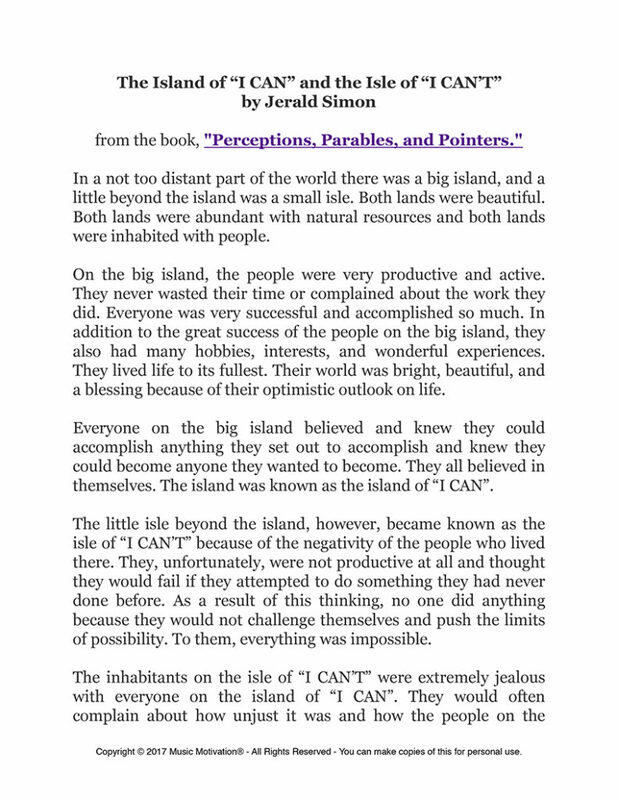 The individuals originally from the isle of “I CAN’T” sadly said life was as unproductive and unsuccessful on the island of “I CAN” as it had been for them before on their own isle. At first, they felt as if they could change when they saw how excited and engaged the islanders were on the island of “I CAN.” “They make everything look easy on the island, but it’s not! We can’t do what they can and we also can’t stand how positive and optimistic everyone is. They honestly think they can do anything they put their mind to – simply by believing they can and then doing it”, one of the “I Can’t” individuals said. Next, one of the “I CAN” islanders spoke up. “How dare you corrupt our youth and teach them they can do anything they believe they can!” Yelled one of the “I Can’t” men. Both parties debated for some time about how effective or ineffective the exchange had been and both parties decided to continue living their lives as they had before. What did change on the island of “I CAN” and on the isle of “I CAN’T” were the children and the teenagers. Many, but not all, of the children and teenagers on the isle of “I CAN’T” began to believe, for the first time, in themselves. They began to think and say “I can” and it slowly began to make a difference on the isle. More and more “I CAN” attitudes were being cultivated and developed on the isle of “I CAN’T”. Many became very productive because of their hard work and positive belief and many were very successful in most everything they did – because they believed they could. Unfortunately, the same effect had happened on the island of “I CAN”. Many of the children and teenagers were negatively affected by the “I CAN’T” visitors who had told them for almost two years straight that they couldn’t and wouldn’t be successful or productive in life. They discouraged the children and teens so much from setting goals and actively participating in life, that many of the youth began to believe the lies they heard. They felt they weren’t good enough, smart enough, pretty enough, or capable enough to accomplish anything and many – far too many – began to lose interest in doing their best and being their best. Some didn’t try because they believed they would make mistakes and fail. Before the two year trade, everyone on the island of “I CAN” had encouraged the children, teenagers, and adults to actively try and not to worry about making mistakes or perceived failures. Everyone knew they were only stepping stones to true success. That of course had changed. Now both the island of “I CAN” and the isle of “I CAN’T” had “I can” attitudes and “I can’t” beliefs as well. Both perspectives were prevalent. Both groups of people were trying to co-exist and work together. The “I Can’s” and the “I Cant’s” are both correct. They can and cannot do whatever they believe they can and cannot do. I hope you enjoyed this little story and the motivational message. Please feel free to click on the image below to download a PDF version of this story that you can share with family and friends and also to teach children and teens the importance of believing the CAN do difficult things and accomplish great accomplishments in life if they believe they CAN! Please share this with anyone who needs a motivational message to inspire them and help them be their best!